If you need to repay your mortgage, you can choose one of two options: direct repayment or indirect repayment. Both options have advantages and disadvantages. When thinking about your mortgage repayments, you should take a long-term view and consider your personal circumstances. Anyone who buys their own home needs to have equity of 20% of the market value. Up to 80% of the market value can be financed using borrowed funds. 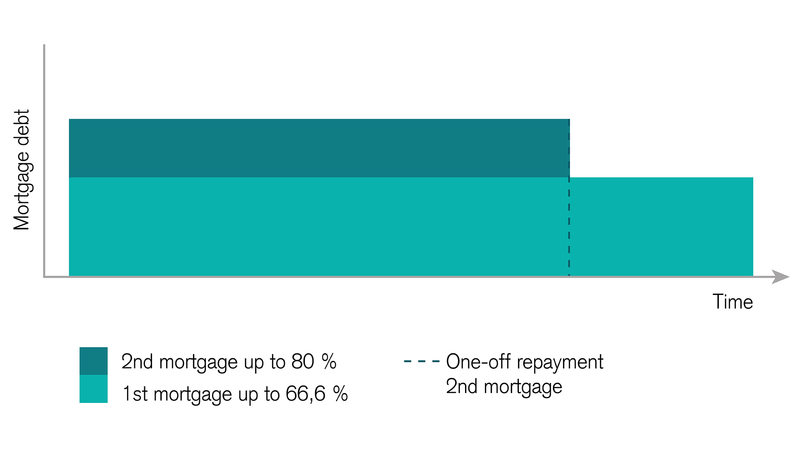 Your first mortgage of up to 66% does not need to be repaid. If the loan-to-value ratio is between 66% and 80%, then a second mortgage is required. This mortgage must be repaid in equal installments—typically annually—within 15 years, and no later than by your 65th birthday. Generally speaking, you can choose one of two repayment methods: direct or indirect. With direct repayments, you pay regular installments back to the bank. This reduces the mortgage debt and thus your interest payments. At the same time, your tax burden increases, since you have fewer potential tax deductions from the debt on your assets and from the interest on income (see image). 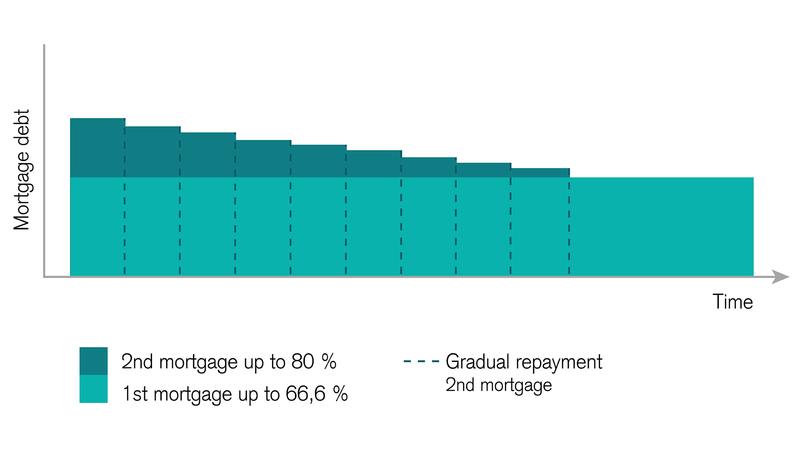 The main advantage of direct repayment is that the amount of interest you pay decreases if mortgage interest rates fall or stay the same, which means that you have more disposable income. This capital could then be used for a targeted pension plan, for instance. With indirect repayments, your mortgage stays constant for the entire term of your mortgage, unlike with direct repayments. That is to say, payments are not made to the mortgage account, but are saved in a pension account or pension securities account (Pillar 3a) and are used to repay the stipulated amount no later than the date on which the borrower turns 65. This means that over the years, the entire mortgage debt can be deducted from taxable assets and the mortgage interest from taxable income. During this process, contributions to Pillar 3a may be paid in and similarly deducted from taxable income up to a statutory maximum amount each year. If withdrawn, the saved capital is taxed, albeit separately and at a lower rate. There is also no wealth tax on pension assets. The repayment method that is right for you will depend on your personal situation, your own financial options, and tax issues. There are also interesting securities solutions for Pillar 3a. It makes sense to have our experts calculate your options in order to optimize your repayments from a pension perspective as well. Planning repayment is an important factor in financing your own home. This video will show you the points you need to keep in mind. Do you have questions about repaying your mortgage? Our experts will be glad to discuss which solution is best suited to your situation. Flexible, well connected, bright. Good floor plans. Floor plans play a key role in the search for an apartment or house. Analysis tools can distinguish between good and bad floor plans. Find out what factors have an effect on floor plan quality and how to recognize a good floor plan. Greater security thanks to a forward mortgage. Mortgage interest rates are currently at record lows and many homeowners want to take advantage of this. With a forward mortgage, you can fix the interest rate of a future fixed-rate mortgage right now, even if your current mortgage has not yet reached the end of its term. Today, young households, families, and senior citizens can barely afford to buy a home in the urban centers. To afford a home of their own, they are fanning out to more reasonably priced regions and accepting a longer commute.